Walgreens wants you to stop by and check out the award-winning Dove beauty products that beauty experts are raving about. 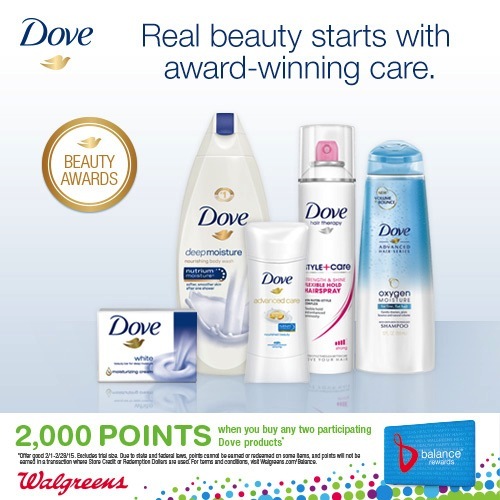 To encourage you to do so, when you purchase 2 qualifying Dove products at Walgreens through February 28, 2015, you’ll get 2,000 Balance Reward Points — the equivalent of $2. Pair this offer with coupons to get an even better deal. Would you like to win a $100 Walgreens gift card? Walgreens is giving away 5 $100 gift cards to readers here this week. To enter to win, just leave a comment on this post telling us about your favorite Dove product or which one you’d love to try. Five winners will be chosen and posted within a week. This post is underwritten by Lunchbox. Read our disclosure policy here. Looking for more? Read more posts about Deals Around Town. I’d love to try the Dove deodorant! My favorite Dove product right now is the Oxygen haircare line. I love all of the Oxygen products I have tried! I like a lot of Dove products, but my favorites are probably their deodorant and body wash. I would love to try Dove Shampoos and Conditioners ! Love the Dove Shampoo/Conditioner; it leaves my hair so clean and fresh. I love the Dove shampoo and conditioner, and I would really like to try the new Dove spray antiperspirent! I always use dove deodorant! I love Dove Body wash. It leaves my skin feeling so silky soft! I love the shampoo. Always look for it! I love the Dove body wash. It’s gentle enough for both my daughter and me (we have very sensitive skin). I haven’t tried the Dove deodorant, but would love to! I really like my Dove Antiperspirant. The body wash is very gentle on my skin. I would love to try them all with that giftcard! I love the Dove deodorant. The deodorant is nice and soft! I have sensitive skin, and Dove’s unscented soap is the soap I rely on. I love 2 dove products. First there deodorant is awesome is smells great and is gentle on my skin. I also love their hairspray it gives a great hold without the sticky build up. Oh I also love their body wash its so thick and creamy and makes your skin feel so soft. I like the deep moisture shower soap. I love their shampoo and conditioners! I always buy them with a coupon. Great giveaway! I’m loyal to Dove hairspray and deodorant. My favorite Dove product is their Deodorant/AntiPerspirant! Dove bar soap is a staple in our home. Would love to try the deodorant! I love all of their shampoo. I love the Dove soap because it doesn’t leave a film on my skin. My skin just feels soft after I use it. I would LOVE to try the DOVE bar soap. The kind my husband uses makes my skin so dry, and I end up using shower gels which are so much more expensive! Love the dove moisturizing body wash! I really love the Dove cool moisture shampoo and conditioner. It makes my hair look and feel so clean and shiny. I use hairspray everyday, so I would love to try their Style + Care Hairspray. We use the Dove Deep Moisture body wash all winter. It’s the best at keeping our skin moist and itchless. I love Dove body wash because it doesn’t irritate my sensitive skin like so many other products do. I really like their moisturizing body wash. Similar to a lot of others, I like the Dove bar soap and would like to try the shampoo as I haven’t yet. I’d love to try the body wash! I love Dove conditioner. My hair is very dry and it is the only product that easily allows me to brush through my hair. I love the deep moisture body wash during the winter months. I love Dove deodorant, very gentle on sensitive skin but also effective! The deodorant and hair spray are my favorites! I like the dove bar soap. It works really well. My favorite Dove product is Dove soap- sensitive skin. I used to use whatever my mom had purchased but my skin was always dry and irritated due to its sensitivity. I started using the Dove Pink sensitive skin bars years back- and haven’t stopped. Whenever I use another brand I don’t feel as soft and clean as when I use dove! We use the Dove bar soap. Recently tried the un scented and really like it. Oh, I love their deodorant! It keeps me dry and is always reliable. I’d like to try the body wash. I love the deodorant and the soap! Both smell and feel refreshing! The Dove Intensive Repair Shampoo. Does a nice job of helping me control my hair in the humidity. Dove soap! It’s the only kind my family can use. We use Dove’s body wash and bar soap. Haven’t tried the deodorant, looks like I should give I try based on others comments. I really like the soap! Would love to try dove shampoo & conditioner. I like the deep moisture body wash! It cleanses without drying out my skin. I love the dove facial moisturizer. My favorite is Dove deodorant especially the pomegranate. I’d like to try the new spray deodorant. I love Dove bodywash. It’s smooth and leaves a clean finish. And I love the way I smell afterwards! I love Dove body wash! It totally leaves my skin so soft. I love the deodorant and the body washes. They make my skin smooth and they smell amazing!! I love the soap because it’s so creamy. I love the dove bar soap! I’ve been a fan of Dove’s deodorants for years, and I also love the company’s body wash. Thanks for hosting this contest! I like the Dove go fresh body wash. It doesn’t ‘stick’ to your skin like most other body washes, and gives a fresh feeling after every bath. Sam’s club gives a free sample of this product occasionally, so it’s worth giving a try! I love Dove Go Fresh soap. My family uses it everyday. Thank you for a great giveaway. We love dove unscented bath bar soap! The fragrance free bar soap. We love and use Dove Shampoo and Conditioner at our house! I LOVE Dove Oxygen Moisture Shampoo. It leaves my hair feeling super clean especially when a lot of times my hair feels flat and heavy. We love the bar soap! I grew up on Dove’s unscented bar soap! I’d like to try the deep moisture lotion. My favorite in their conditioner for dry hair by I would like to try their new curls line. I love the smell of the soap! I love their new dry spray deodorant!! I love the good old fashioned Dove soap bar. It’s the only soap bar I’ll use! I would like to try Dove soap. I have heard good things about it. I would love to try the Dove bar soap. In the past I’veloved the body wash . I really like Dove deodorant! Dove body wash and bar soap! I am actually brand loyal to Dove bar soap! Love it! I like Dove deep moisture body wash. So silky! I really like Dove deodorant. Dove deep moisture body wash. I got it when there was a catalina deal, otherwise, i would have never tired it. 🙂 I don’t think we can use any other brand from now on. Everyone loves how soft our skin feels. I’ve used Dove bar soap for years, it’s by far my favorite! I like how the body wash feels. I like Dove moisturizing shampoo. The beautician said my hair was dry so I have been using it for the past month. I love their Dove Pink bar soap. My whole family loves it. I love their facial moisturizer! I’ve been using Dove Frizz Control conditioner, and I really like it! I really like their soap! I love the Oxygen Moisture and volume shampoo! I love the traditional soap and their conditioner. I use the dove sensitive ultimate clear deodorant. And Dove lotion is divine, my husband uses the men’s variety. My favorite Dove product is the sensitive skin bar soap. I love Dove bar soap and Dove conditioner! I love the body wash (and so does my husband…shhh!) It makes me feel so soft! I love the standard Dove bar. Reminds me of my mother. I love Dove body wash! I love the bar soap. Thanks for the opportunity! I have used the original Dove soap since I was a teenager, love it! I love the women’s cucumber melon deodorant and the sensitive skin bar soap! I love their shampoo and finishing cream! I like their shampoo and conditioner! I love the scent of the Dove beauty bar! Dove Oxygen Moisture makes my hair feel light and soft. Dove deodorant. Goes on smooth and is clear. I like the Dove bar soap. It does not dry out my skin as much as most soaps. I love the Dove bar soap for sensitive skin. I love Dove deep moisture body wash and the sensitive skin body. It is the only body wash I can use that doesn’t make my skin freak out. I have been using it forever. Their body wash is the best! I like the dove unscented bar soap. I have fragrance allergies and this doesn’t aggrivate them OR dry out my skin. My favorite is the pomegranate & lemon verbena bar soap (from their Go Fresh Revive) line. I’ve been using Dove bar soaps since my college days. My husband and son both have sensitive skin, and they love the Dove bar soaps. It’s especially helpful for the dry weather we’ve been having. It’s also a frugal alternative to body washes and liquid hand soaps. Thanks for the opportunity! I love Dove body bars! Any of them! They really leave my skin soft. I like the antiperspirant! The scent doesn’t burn my nose. i only use dove bar soap! and i’ve wanted to try the dove dry shampoo. thank you! Dove soap has been my go-to soap to wash my face. Dove deodorant is the best!! I have sensitive skin and it never burns! My favorite is Dove’s Anti-Perspirant Deodorant, Original Clean. I like the bar soap. It would be good for this cold weather. I just love the plain ol’ beauty bar. That’s been my go-to shower bar for years. It keeps my skin nice and soft! I like the bar soap. I love the shampoo and conditioner….not only does it smell amazing, but leaves my hair super soft and nice wavy curls! Would like to try the citrus soaps. Love citrus especially w/ snow outside! Dove Beauty Bar for sensitive skin is the only one that our family can use. Even our pediatrician recommends it for the kids. I like the Dove body wash! I like the Dove body wash. I love dove body wash, any scent! I love their sensitive body wash. I had a rash (unknown allergy) and it was one of the few body washes that didn’t further irritate it. I like their new shampoo the best! Their body wash is nice! I love Dove hair products and the deodorant. Actually, there isn’t much as far as Dove products that I don’t like! Thanks for the giveaway! I don’t think I’ve tried any Dove products in a long time. I would love to try any of them. Would like to try the new dry spray deodorant. I love the Dove Nutrive Solutions Nourishing Oil Care shampoo and conditioner! I have long and thick curly red hair and it’s the only shampoo/conditioner I have ever used that I can brush my hair after the shower with no tangles! It’s the only shampoo/conditioner I’ll use! My favorite is their dove body wash. Very smooth and moisturize. I LOVE the Dove body wash!!! Love good old dove soap! I love the plain bar soap. My son has the worst eczema that my pediatrician sees and sometimes he looks so pathetic, being in a head to toe rash from sensitive skin. He loves having his “special soap”! It’s a tie between Dove bar soap and Dove anti-perspirant. Use them every day- love that they are both so gentle on my skin. Dove Winter Care bar soap is my favorite. I love the Dove bar soap, so gentle and mild on my skin yet gets the job done! We use the Dove bar soap. It does not dry out our skin like other brands. Dove bar soap – for 20+ years. Love it! What a great opportunity to try out the dove soap and other new items they have. Thank you! I use their deodorant, and I’d like to try their advanced moisture hair products. I use Dove deodorant, bar soap, and body wash – I’m a big fan! I really enjoy their hairspray. It is as good as some higher end brands. i love the dove bar soap. leaves my skin so soft. I love Dove Body Wash for Sensitive Skin. Our pediatrician also recommends it for my toddler son, never dries his skin out! I like their bar soap for sensitive skin! My favorite is Dove cucumber and green tea Go Fresh Deoderant. It has such a clean, subtle scent and works throughout the day. My favorite Dove product is the Dove Sensitive Skin Body Wash! It is gentle and moisturizing, which is a necessity during the harsh winter months. My favorite is the Dove Sensitive Skin bar soap. I really like using Dove deodorant! I like Dove bar soaps! I love Dove’s deodorant. It goes on silky smooth, gives lasting protection, smells great and I feel it softens and conditions my skins. Great product and I recommend it to everyone! I’d like to try any of their body washes. I have never used them! Love the sensitive skin bar soap. Dove Deep Moisture Body Wash. My dermatologist recommended it several years ago and I’ve been using it ever since. Love Dove deodorant. Been using it for years! It does not break me out. I love Dove deodorant! I don’t wear anything else! I like the Go Fresh pomegranate body wash. We use it in our liquid soap dispenser. I’d like to try the vanilla and shea butter body wash too. I love Dove body wash but my husband prefers the dove bars! I love the Dove Oxygen moisture shampoo & conditioner! I love the Dove body wash it leaves my skin feeling silky smooth and smelling fantastic! I also love the deodorant! I love Dove deodorant. My skin is very sensitive so I have to be careful with fragrances, so far I haven’t had any issues and I’m so grateful! I love their deoderant and have used it for years! I love the body wash! Dove is great. I like their body wash and deodorant. I am thankful for a company that focuses on TRUE beauty. I love the body wash..makes my skin soft 🙂 Would love to try Doves other products as well. Last year my grandson kept breaking out all over his body . I took him to the dermatologist and they said it was staff infection. They told me to use Dove soap ( I used Dove Body Wash) and then put Cetaphil Lotion on him. It worked like a charm. Any time I see him start to break out that is what i use. Actually if you follow this routine all the time he doesnt seem to break out with it. A friend of mine tried this on her shingles and she said it really helped. Dove is the best!!!! Dove soap, it’s the only one my husband will use. I use their shampoo every day, and also use it on my 6 year old and 9 year old. I love Dove hair products. I love the Dove Beauty Bar soap. I am also loving their new in-shower body lotion. I’d love to try dove shampoo and conditioner! I love white & sensitive skin soaps and body washes. I recommend them regularly to my patients!! I love that Dove offers fragrance free products for those who cannot tolerate the scented products! I’d love to try the antiperspirant spray! My dermatologist recommended the Dove bar soap, so it’s on my list of things to try! The bar soap–my family used it for years while growing up. It was recommended to us for sensitive skin when my brother and I were young. I love, love, love Dove products. I really want to try the new dry deodorant. I used their haircare and deoderant. Love Dove products. Gentle and moisturizing. I would like to try Dove Hairspray. I like the body wash and the beauty bar. The body wash is great for my dry skin. I use the beauty bar on my face which can be both only and dry in places. The dove body wash is the best, makes your skin feel so silky clean! I love Dove Body Wash. I love Dove shampoo! Smells really nice! I love Dove’s body wash! I would like to try hair products. I have never tried dove shampoo and conditioner, but I have heard good things about them and would love to try them! Would like to try their body wash! I like the body wash. It doesn’t leave my skin dry or with a filmy feeling. I LOVE Dove deodorant. I won’t use anything else! I love their body washes! Nothing compares to them. They leave my skin soft, and I also use it on my pug, and it slows down his shedding. Love! I am a traditionalist here. I love the bar soap. Our family uses it regularly. I’d like to try the Dove hairspray. I love Dove White Soap, leaves the skin so soft and clean. I was told by a dermatologist 15 years ago that the basic Dove bar of soap is the best thing to wash my face with. She has been right so far. That is all I use and I get compliments all the time on my complexion. I give credit to Dove. Dove is actually the only body wash I use. It doesn’t dry out my skin and I feel so smooth after. I also use the shampoo and conditioner. I would like to try the hair products – the hairspray. Body wash is my favorite. I love their body wash. It was the one my mom always used, and smelling it reminds me of her! I love all the Dove products…especially the body wash! I really love the Dove bodywash 🙂 Makes my skin feel soft all day long! I love the Dove soap for sensitive skin. Dove anti-perspirant is the best out there. I have been using it for years and I would never use anything else. I love the Dove bar soap. The only bar I use! I love Dove body wash and would like to try the deodorant next. I love Dove’s bar soap. It is soft smelling and doesn’t dry my skin out! Its definitely my soap of choice. Love, love, love the deodorant! The gentle exfoliating bar is the only soap my family will use! I love the body wash for sensitive skin. It is perfect for my baby girl’s eczema! I love their body wash, although its a treat at our house! We usually use their bar soap. I would be thrilled to use it regularly! My absolute favorite Dove product is their cucumber body bar soap. Doesn’t dry our skin and we don’t feel sticky afterwards. I love Dove’s nourishing body wash! My family has used Dove bar soap for years! It’s the only bar we all agree isn’t over-scented. I use the Dove soap bar for sensitive skin. I’ve been using it for as long as o can remember and it’s the only soap I buy! I love the Dove bar soap I have. I want to try the new dry spray antiperspirant. Our family only uses Dove white bar soap. It is the gentlest on our skin and the one that moisturizes best. I love the Dove bodywash! Such a great moisturizer! I tried a sample of dove dry oil. And man, it is great. The smell, texture, and effectiveness at taming frizzy hair is great. It doesn’t make hair look dirty or greasy. I would love to get a big bottle or two, and some other products to try as well. I just love Doves go fresh Revitalize Beauty Bar. It is super moisturizing and smells great. It brightens my day in my morning shower. I love their unscented pure moisture soap!! Love the deodorant and soap. Would like to try the body was. I am a big fan of Dove body washes, but I would also like to try the Dove deodorant. Walgreens is one of my favorite stores! I’ve been using the deodorant and I love it. Great smell. I like their bar soap. My favorite product is the original bar soap. It is so moisturizing! I have loved Dove soap ever since my Mother introduced it to me as a young girl. I would like to try the cucumber dove. I have been wanting to try the deodorant. Have used Dove products and liked them. Would love to win! The dove soap, love it. It really does moisturize. Dove soap! It’s always been comforting and makes me feel good! I would love to try their deodorants! love their shampoo for frizzy hair! I would love to try the oxygen moisture shampoo and conditioner! I love Dove sensitive bar soap! I use Dove soap bars and deodorant. The soap leaves my skin really soft. The deodorant is effective yet gentle. I have also used their intense conditioning treatment on my daughter’s hair and it tamed the frizz great! I love the body soap! I love their bar soap. I want to try the dry spray deodorant. I love the Dove Deep Moisture body wash, it’s the best! This time of year I love Dove soap. The softness is great on my winter wreary skin! Deoderant — it’s the only brand I’ve found that doesn’t irritate my skin. I like Dove body wash the best! This time of year I love Dove soap. The softness is great on my winter weary skin! My favorite is Dove soap. I love the smell! We struggle with dry skin so we’d love to dry the body wash. I don’t know what I would do without my Dove deodorant! It smells amazing (people comment on it all the time thinking it’s perfume), doesn’t irritate my skin, and lasts all day. I really love the body wash and the deoderant. Actually, I love so many Dove products it’s hard to narrow it down. My husband uses the Dove bar soap and I use the Dove Body wash. I especially like the Dove go fresh cool moisture body wash. I love dove deodorant, would love to try the body washes! My husband and I both use the white beauty bar or gentle exfoliating bar…extra moisturizing for the winter and smells wonderful. I would love to try the Dove Oxygen root lift spray for my fine, thin hair. I have used (and loved) Dove deoderant for years now! They have lots of great products but my favorite is honestly the bar soap. I have been using it most of my life. Dove deodorant is the BEST! I love,love,love the powder scent,such a mild but refreshing smell! I just discovered Dove Deep Moisture Nourishing Body Wash and love it. I’d love to try the Dove hairspray! I adore the Dove deodorant. The shampoo is equally amazing. I love Dove’s dry shampoo!! I work full time and have 3 small children so washing my hair is sometimes a luxury I don’t have time for. It obsorbs oil and leaves my hair smelling great!! Love the Dove Body Wash ~ it just smells so good! I love the Dove body wash and bar soap! They are so moisturizing on my extremely dry skin! My favorite is the dove weightless conditioners. I have fine hair and it conditions without weighing my hair down. I love the Dove bar soap for my boys. Very gentle on their skin. I love the deodorant, and the body lotion leaves your skin so moisturized. I don’t use dove products, but I would love to try them. I would love to try the Dove Oxygen root lift spray my hair is long and straight. I love the body wash!!!! I would love to try the Dove Sensitive Skin Body Wash. Hopefully my skin wouldn’t be itchy right after showering. I love Dove bar soap, especially in the winter! Dove Hair Care is some of my favorite! I’d like to try more of the body wash. I switched to dove shampoo and conditioner from another brand that left my hair feeling dry and brittle. Now my hair is soft and manageable and smells nice to boot! My daughter and I are fans of the gentle exfoliating soap. We would both love to try the Dove hair products. I love the Dove Bar soap. I’ve recently started using the Dove body wash, too. I love dove! I’d love to try the hairspray! I like their body wash! I like the bar soap that has the tiny beads that scrubs the skin. I also use the deodorant. I want to try the shampoo! I love Dove’s winter care beauty bar! I’ve been using their bar soap ever since I was 18 and I still use it many years later. It is the best. The pink bar soap is really great. I like the body wash. I would like to try the shampoo, hairspray, and deodorant. I really like the moisturizing body wash. I’d love to try their shampoo! I love the dove soap and the soap with lotions and my sons love dove men’s soaps and bodywashes! I use Doves pistachio cream and magnolia purely pampering body wash and absolutely love it! Noticeably softer skin! I use the bar soap! My favorite product is the good ole white soap 🙂 and my husband loves everything, especially the shampoo + conditioner. We use a ton of Dove products in our house!! I love the soap and lotion! I’d like to try their lotion! My fav is the deodorant. Doesn’t give me a rash like other products do. I LOVE the Cream Oil Body Wash. It is so good for dry skin in cold winter weather! I have been using the shampoo and conditioner for years. They are the only brand that leave my hair moisturized and manageable. We’ve just started using the body soap- my son has eczema and it’s helped his breakouts! Would love to try the shampoo. We use dove sensitive skin bar soap every day! Dove is the product I use. Soap, shampoo, conditioner, body wash. I haven’t tried the deodorant. I love their volumizing hair products. I love their bar soap – it really is the best for my drier type skin! I love Dove Go Fresh antiperspirant deodorant, especially the cucumber green tea scent. I would love to try the new Dove Dry Antiperspirant Spray. love the bar soap for sensitive skin. would like to try the body wash.
My favorite Dove product is the daily moisture shampoo, I use it everyday! I like their deep moisture lotion! I love Dove Deodorant. Its all I use. I love their moisturizing body wash. It’s especially helpful in the winter! I love dove deodorant and their moisture rich shampoo and conditioner! i use both the shampoo, the conditioner, and the bar soap. I LOVE dove.. my hair and skin is so soft. I love Dove soap – I’ve used it for many years!! I like the Dove bar soap! I have used Dove unscented bar soap for years after having a reaction to a perfume in another brand. I am so grateful for it! I would love to try their lotion. Thanks for the chance to win! I like the dove bar soap. My favorite Dove product is their deodorant but I like their shampoo as well. Dove is the only soap or body wash I use. I love Dove products! I use the soap, body wash, and lotion. I love the deodorant. No burn even after shaving. No rash. Glides on smooth. I love the shampoo and body wash. I use it everyday!!! I have deodorant allergies and Dove is the only brand that doesn’t make me break out! I love it. I love the bar soap! I LOVE the nourishing body wash, deodorant, and dry shampoo!! I like Dove shampoo & conditioner. We just rediscovered Dove soap due to our daughters diagnosis of eczema. We love Dove bar soap. Thank you for the chance. I’d love to try the new stay deodorant! I have used the Dove white moisturizing soap since childhood! It’s a great product, and I love the smell! The dove body wash is amazing. Love Dove soap and deodorant. I love Dove soap, because it has a subtle fragrance and is gentle on my sensitive skin. I would love to try the shampoo or body wash. I enjoy the soap. There is not a better soap than dove. I also have used the shampoo and enjoyed it. I love the body wash, and want to try the shampoo! We love Dove soap. We love the smell of it too! I love Dove deodorant and body wash. It is perfect for my sensitive skin and smells so fresh! Dove Men’s Body Wash is the best shower soap out there! I like to shave with the deep moisture body wash. I would like to try the deep moisturizing lotion and the flexible hold hairspray. I really love their deep moisture body wash, but during the winter i use their winter care one, its the best one! Their deodorants are my favorite as well. Just picked up the dry shampoo to try out. I love the deodorant and face moisturizers! I love the Dove Beauty Bars for sensitive skin. It’s the only brand we use. We love their body wash! Their dry shampoo has been recommended as working well and smelling awesome so I can’t wait to try that as well. I use the shampoo and conditioner. Love them! I ALWAYS used body wash for my dry skin until one day I ran out. The only option was using the Dove soap my husband swore by. After that first experience, I was hooked! I LOVE Dove soap 🙂 m.
I like the Dove shampoo & conditioner for color-treated hair. I’ve never tried the deodorant, but would like to. I would love to try the body wash! I love all of Dove products, it is all that I use. I love their conditioner. I would love to try Dove Body wash. The Dove Nutri Body Wash is what I use everyday. It leaves my skin smooth and hydrates it during the harsh Ohio winters. My dermatologist recommends it! Would really like to try the deep moisture lotion! I use Dove body wash every day. I love the Dove body wash. I find it is really moisturizing, especially during the winter. I love the Dove deep moisturizing body wash. I frequently use and love Dove’s deodorant and body wash. I would love to try Dove’s hairstyle products! The Dove body wash is the best keeping my skin hydrated and moist during the harsh Ohio winters. My dermatologist recommends it too! Thanks for the giveaway, i like the Barsoap and the deodorant, and i love to buy at my Wgreen. I’d love to try the deep moisture body wash! I like the dove body wash. It is creamy and not too runny. I would like to try the deodorant. I’d like to try the Winter Care Body Wash. I love using Dove’s body wash. I love Dove hair care products. They work great on my natural curls. I love the moisturizing body wash! Love the anti-perspirant in Fresh scent. Can’t wait to try the new spray. i Love the deoderant! It’s the only brand that doesn’t break me out., we use the shampoo and conditioner as well. I love Dove Sensitive body wash! My daughter and I have super sensitive skin and Dove’s body wash is the only one that doesn’t make us break out! we love the soaps! my husband buys them each month! I love the Dove Advance Care Deodorant. It really does improve the look and feel of your underarms while still doing the job of a deodorant. Love their basic moisturizing bar! I love the moisturizing shampoo and conditioner. I love all Dove products but I am dying to try their new line of curly hair products! We loge the sensitive skin. It is unscented and is the ONLY soap my husband can use that doesn’t bother his skin! I LOVE their deodorant for men! It smells amazing! The body wash is just what we need during these cold winter months. It’s great for moms, dads, and toddlers too!!!! I would love to try the Oxygen Shampoo. Yeah, I would definitely say my hair could use a breath of fresh air! I love the Dove hairspray! I have used Dove moisturizing soap to wash my face for years. Love it! I love their shampoo. It leaves my hair so clean and shiny. I have only really used the basic bar soap but would love to try the other products. I use and love Dove soap!!! I’d love to try their deodorant! I really like the body wash. I really like Dove’s Oil Care products, but I know there are many other products I have tried and liked in the past. We’re huge fans! I love their body wash but would also like to try their deodorant. We only use Dove sensitive bar soap!! We’ve been huge fans for years. I’ve been using the soap since I was a child because it is great for sensitive skin. i’ve always used their soap because it’s pretty moisturizing. Dove ultra moisturizing body wash is amazing! We love the deep moisturizing body wash. 2 of my kids have eczema and this helps keep it at bay. I love Dove deodorant. It smells nice, leaves underarms soft and keeps me fresh all day! My absolute favorite Dove product is the Dove unscented bar soap. It soothes my dry winter skin! We love the deep moisturizing body wash. 2 of my kids have eczema and this helps keep it away! The body wash leaves your skin feeling so soft. We love Dove bar soaps. The dove white beauty bar soap is my favorite. It reminds me of my childhood as that is all we ever used. I’m still using it to this day with my own family! My favorite product Is the deodorant, I’d like to try the body wash! I fell in love with Dove products after the sensitive face bar saved my skin. Having little ones in late thirties somehow made skin breakout and pregnancy acne even a year after the last little one was here. After trying several things for over a year, I used someone else’s soap while traveling and haven’t used anything since. I love their body wash! I like their body wash and conditioner but I did not get a chance to try all the types so I would like to try more. Dove’s Mositurizing body wash is the best. Love Dove’s body wash but would also one to try their new line of products for curly hair. My daughter and I both have thick, curly hair and are always searching for products that work well for curly hair! My favorite Dove product is Dove Sensitive bar soap. It has no perfumes or dyes. It’s great for sensitive skin and moisturizes. I would like to try the Dove deodorant. I love the body wash! The shampoo is good also. Dove deodorant is my favorite. I would love to try the new line of products for curly hair!!! Always looking for curl quenchers and dove is all about moisture! My favorite Dove products are the shampoo and conditioners! I like the unscented deodorant. Dove sensitive bar soaps is the only soap I can use on my body. It’s also the only soap I buy for my family. I love Dove deodorants and body wash! With my sensitive skin it is what works the best hands down! Dove sensitive is the only brand soap I will use. I love the shampoo and conditioner, but think I need to try the body wash after all the ‘love its’ here! I like the unscented sensitive bar soaps. The soap is the most popular item around my house. I would like to try the body wash that everyone seems to love! I want to try the Dove Beauty Bar! Love sensitive skin body wash by Dove! I love their unscented bar for sensitive skin! I use and love Dove moisturizing body wash.
Dove soap is especially nice during cold, drying winter months. In bar form or body wash, both make skin feel soft and hydrated. I buy their unscented soap. Only soap my whole family uses. Wouldn’t change it. Everyday I use Dove Conditioner. I love the moisturizing bodywash! Its what helps my skin survive the dry winter! The body wash and shampoo! Daily moisture shampoo & conditioner! I love their basic soap, but I’d really like to try the body wash! I love their shampoo and deodorant both! I’d like to try the body wash! I would like to try the body wash! I am super excited to try the new shampoo for curlies! I absolutely love the Dove Go Fresh Revive Body Wash and Deodorant. It smells great and leaves my skin soft. I would really like to try the Dove Quench Absolute Crème Serum. I would like to get my curly hair looking healthier. I Love the dove sensitive skin body wash…it’s the perfect body wash for my dry skin! I like the Dove hair products, especially the hairspray. It’s hard to beat their body wash! Love it! I love the sensitive skin body bar! I love the dove body wash as well as the soap! Dove unscented bar soap is the only thing I will use on my babies, they have all had sensitive skin. I use Dove bar soap everyday. It has been my consistent facial soap for years and as I approach 60, I swear it’s helping to keep wrinkles away! I love the Dove shampoo and conditioner! I like Dove deodorant. It stays on and keeps me smelling sweet. I love the Dove bar soap and shampoo! I want to try the Dove Style and care! Love love love bar soap, always have and always will! Love the antiperspirant in Fresh fragrance. Can’t wait to try the spray on. I love the original Dove beauty bar soap. I love Dove body wash and would love to try the new line for curly hair! I love their deodorant and moisturizers. I would love to try your deodorant. I love the moisturizing exfoliating body wash.
Dove conditioner is my favorite! I absolutely love Dove Shampoo!!!! I would love to try the new products with oxygen…sounds fun! I really like my Dove Ultimate deodorant. It works great and I enjoy the scent! I’m fond of the reliable Dove bar. I like the moisturizing body wash. I enjoy using the Dove soap. It leaves my skin feeling soft, smooth and gets rid on my dryness. Love Dove’s body wash, thanks! Original Dove bars, got rid of my severe eczema as a kid, and took care of my kids’ eczema. Its the only soap we use here. We love the Dove body wash! We’ve been using it for several years now. We’ve also used the shampoo & conditioner a few times over the years. The soap, definitely! My grandma only used Dove soap. I loved visiting their house. To this day, the smell of Dove Pink soap bars brings back great memories! dove bodywash has always been a favorite. Keeps your skin soft and not all tight and dried out feeling like alot of other washes. I’ve used Dove’s deodorants for years. Love them! I love all Dove deodorant! I would love to try something from the Damage Therapy line. I love my deodorant & would love to try some of the new hair care products. I am a Dove girl. I use their body bar, body wash and deodorant. I want to try the dry spray deodorant next. I would like to try the Dove bar soap. I love Dove bath bars! They leave skin moisturized and soft. I love dove body wash!!!!! My favorite Dove product is the white beauty bar (soap). Here’s a great tip: if you store a box of unopened Dove bar soap in your linen closet all of your towels and sheets will smell fresh and clean. I would like to try some of the newer products, especially the body washes. The Dove unscented bar soaps are my go-to for our little ones and their super-sensitive skin! Dove soap is good! Would like to try body wash.
We all use the Dove sensitive skin moisturizer bars, they’ve helped all of us with eczema. Us girls also love their cucumber deoderant. I love Dove in general because of the products and their campaigns. I like the dove body washes. I am a huge fan of their deodorants. Ever since i hit my mid 30s, Dove is the only brand that holds up to this Florida heat. I just bought two of the Dove advanced care deoderant. Cant wait to try! Their hair conditioners, love them! We love dove body wash. I would love to try Dove’s body wash! I love their shampoo and conditioners. I love dove shampoo and conditioner, it does not leave my hair frizzy. My husband uses dove men n clear soap everyday. His favorite by far. I do enjoy Dove products they smell good and dont irritate my skin. Love the moisturizing body wash!! My favorite Winter Time product is CREAM OIL SHEA BUTTER BODY LOTION. It absorbs fast while keeping my skin free of winter time dryness and itching. I use Dove sensitive bar soap. It is the only kind of soap I can use that doesn’t make my skin react. I love their deodorant and bar soap! Want to try their new dry deodorant spray. I love Dove products. The body wash is my fav. I’d love to try the moisturizer. I am a huge fan of their soap. Nothing is better than Dove. My favorite Dove product is the body wash! Thanks! I love Dove’s dry shampoo! I have used pricier brands but theirs works just as well for a lot less. It zaps the oil but also gives you great volume. I sometimes even use it on the day I shampoo for the lift. I love the bar soap. I would love to try the lotion. I love the bar soaps! I want to feel how silky smooth my skin is going to feel! Dove beauty bar soap is the only bar soap I trust to use on my skin. Love, Love, Love it! I am a huge fan of their sensitive skin no scent shower gel! My husband’s skin breaks out with most shower gels but this one from Dove does wonders! I love their body washes.Your skin feels so soft. I really like their new products mens care. Dove has finally figured out how to care for men! Dove bar soap is the best! I’d love to try their deodorant. I just love the Dove bar soap! I would like to try the Dove’s body wash.
My favorite Dove product is the Oxygen Moisture conditioner. It leaves my hair so soft without leaving a build-up. I love the Dove bar soaps. I use them in my shower and sink, but I love using the bars for my homemade laundry soap as well. Dove deodorant is the best in my opinion! I love the deep moisture bath wash.
We love Dove moisturizing body wash. Many of us have eczema and this helps keep our skin moist. I love their body wash!! My family loves their soaps! I would love to try the Deep Moisture body wash. With the winter leaving my skin dry, I am hoping this would help hydrate it. Dove body wash keeps my skin soft during this harsh winter. I love Dove hair therapy nutritive solutions daily moisture shampoo. It leaves my hair so soft. I have long hair and this has been helping with my split ends better than all the other shampoos I have tried. I would love to try Dove body wash! Dove body wash is really nice, but hard to get for a stockup price. I would like to try their Winter Care Body Wash.
Love the original Dove Bar Soap! My 5 daughters and myself would all enjoy trying the newest hair and body products! The new dry deodorant sound great for sf utter a workout when I am rushing to get to work. Would love to try. I love the Dove moisturizing body wash. I love Dove Advanced Care deodorant! I think their shampoo and conditioner would be great. Also, we have used their bar soap and, it was easy on our hands. The new spray deodorant looks really interesting to try. My favorite Dove product is their ‘Go Sleeveless’ deodorant line. It really does help with underarm razor reactions. So smooth! I like their body wash. Their conditioner, too, if I can get it on sale! I love the shampoo and conditioner!! I love the body wash. I would live to try the deodorant! Deep moisturizing shampoo and conditioner keeps my hair sleek and helps prevent frizz! I use the Dove Body Wash! I enjoy Dove Bar Soap. Original Dove Bar soap. The best for sensitive skin. Oh I love any and all Dove products. They always make my skin feel so soft and wonderful! The only downside is that sometimes if I use a bit too much in the shower it can get a little slippery! I like the deodorants and shampoo!!! I have used nothing but Dove Beauty Bar Soap for years, anything else chaps my face and legs. I love their shampoo-it’s the only one that is moisturizing without making it greasy. Dove Body wash is my favorite Dove product! I always use Dove beauty bars! So many great types, love them all. I love their deodorants. They work well and don’t clog your razor. We all have such dry skin in the winter especially our kids and would love to try the moisturizing body wash! I love Dove soap bars! thanks! I love the shower gels they always make me feel so clean and fresh! The oxygen moisture shampoo is one I would like to try. I love their deodorant and soap! Would love to try the moisturizing body wash. I use Dove deodorant. It gives me the protection i need all day. I love the soap and would like to try the body wash. I use Dove’s moisturizing conditioner daily. Keeps my curls looking great! I have eczema so I use Dove bar soap. Love their deodorant and the only brand I use. I’d love to try the Dove deep moisture. Hope it helps this dry flaky skin during this winter blast! We use their shampoo and conditioner and love it! I’ve used their beauty bar unscented exclusively for most of my life due to skin sensitivities. I want to try more of their hair products. I would love to try their body wash. We live in NV & it’s unbelievably dry! Every time I’ve tried it, I’ve loved their body wash!!! I love all dove products. Dove deodorant is the only kind I like for my sensitive skin. Dove soap (the white) is a MUST at our house with all this sensitive skin. Thanks for the giveaway! I love Dove’s soap bar for sensitive skin. I have a Lupus related skin condition, and it’s the only thing I can use that doesn’t irritate my skin. I love it! I still love the Dove bar soap. Smells so good! I love all Dove products. They keep you clean and refreshed all day long!!! Nothing beats Dove!!! I love all Dove products!!! I would try their shampoo. My favorite is the Dove Body Wash. I love their deodorants! Dove is the only brand i can use! Dove deodorant is the only deodorant I can wear without causing a rash. I LOVE the Dove Shea Butter Body Wash!! I like Dove body soap! Dove bar soap is a favorite at our house. Dove bars are the best (any product really!). My fiance is suffering from sensitive skin but Dove bars (even with fragrance) never irritates his skin. I’ve also recently tried Dove Oxygen Moisture shampoo and love how light it is on my hair but never dry. We’re both huge fans of Dove products! I love Dove deodorant and their body wash is great too! I really like their shampoos – their fragrance is not too strong, and they leave my hair super soft. I would like to try Dove deodorant, I love the bar soap & body wash. I have always used their soap. I would love to try the body wash.. I would love to try Dove’s deep moisture body wash! I love their deodorants! So nice and gentle on the underarms. I love their body wash but would like to try the deodorant! I would love to try the deodorant or lotion! I like Dove hairspray, dry shampoo, and deodorant. I would love to try their new advanced care deodorant! I like to use Doves unscented bar soap for my son’s soap sensitive skin. I am using a Dove conditioner that I like. I have used their shampoo and conditioner and they are pretty high quality! The dove bar soap would be fun to try! My favorites are the shampoo and conditioner – Love using them on my hair – Smells great too! I love the dove go fresh revive body wash. It smells great! I love the original dove bars. My grandmother used them in her bath and had a bar at every sink in the house. The smell of them is quite nostalgic to me. I love Dove body wash. I would like to try Dove deodorant. I love the Dove body Wash! They leave me feeling soft and silky, and they smell wonderful! I love Dove body wash as well and would like to try their other products. Thanks for entering me in the gift card giveaway! I love their body wash, and want to try more of the hair styling products. I’d love to try their hairspray. My old brand has changed and isn’t working for me anymore. I actually discovered Dove products while studying overseas in college. In a Norwegian grocery store, I quickly spotted “Dove” among several foreign labels I didn’t recognize. I bought lotion and deoderant and enjoyed the fresh clean scents. Other people complimented me on them, too! I’ve only used the body wash but would like to try many of the other products. I love Dove body wash!!! I use Dove sensitive skin unscented bar soap. I love the Dove shampoo! I enjoy Dove body wash and deodorant…affordable quality, for sure! I would love to try their deep moisturizing lotion. I have very dry skin and this time of year is really tough to keep moisture in my skin. Thanks for the chance! I love all of Dove’s products, but especially love using their shampoo and conditioner on my children’s hair. It makes a difference! I use many Dove products! I would love to try their hair spray! I’d love to try the deep moisture lotion. I have used Dove Beauty Bar for most of my life. I love it and wouldn’t use anything else! I love the Dove stick deodorant and would love to try the spray deodorant. I love the Dove soap bar and deodorant. Love Dove unscented body wash. Pediatrician recommended for baby. I like the body wash a lot. I’m cuurently using the wash-deep moisture one. Love to try any of their shampoos that give life & body to hair. I love dove deodorant, have been using it for year! I love the Dove shampoo and conditioner. I would like to try the body wash. I want to try the Dove Deep Moisture lotion! I would love to try their shampoo and conditioner! I like the moisturizing shampoo and conditioner. I love the regular dove soap bars.They are perfect because They never leave soap scum in your bathtub or your shower. I’ve been using them for years! I like Dove hair products! Dove deodorant! it’s the best, never have to worry when I use it! I love the Dove body wash! I have used the Dove bar soap for years – it’s the only one I will use. Met my fiancé and he uses Dove shampoo plus conditioner – it’s the only one he will use! Has to be LOVE!!!! I want to try their bodywash and I love all of the Dove soaps. I haven’t used any yet, but a friend loves the dry shampoo, so I would like to try that. I really like the deodorant. It smells so nice! I like their shampoo and conditioner. They make my hair so soft! I love their Dry Oil with macadamia nut oil, it smells great in my hair without making it look greasy. Would love to win a Walgreens gift card. I want to try Dove body wash.
I’d love to try the Dove deodorant. My favorite Dove product is deodorant! I like the unscented bar soap. I love the Dove moisturizing body bars. It’s the only soap my husband and I use. I love the fact that it doesn’t dry out my skin…even during the cold winters! I really like Dove body wash! I’ve been using the Dove beauty bars to wash my face since I was 20 years old, 20 years ago! I haven’t tried their hair care products though. I would love to give them a try. I have very sensitive skin… I love the Dove deodorant, have been using it for years. I also really like the Dove body wash, since it leaves my skin soft and moisturized and does not irritate. I love the dove body bar soap! My favorite Dove product is Dove White Beauty Bar. It is the best cleansing product I have used on my very sensitive acne-prone skin, helping to maintain my skin soft and moisturized while keeping it clean. I love Dove deodorant, especially the fresh scent! I love Dove bodywash for men because it makes my hubby smell so good! I LOOOOOOOVE Dove Sensitive Skin Beauty Bar. Everything else makes my family’s skin itchy! I feel like it cleans my skin without a residue. We would not use anything else. The lotion…seriously the only thing that works for me! I love the dove bar soap. I would love to try the dove hairspray. I am intrigued by the dry oil. Definitely want to try that! I am a faithful Dove Soap user, just the plain white bar, or liquid body wash. We have sensitive skin, and this is only thing that we can use! I would like to try some of their styling aids, like their hairspray, and maybe a treatment for our hair. I love Dove body wash because I use it for body and hair. I just tried the new Dove Dry Spray Antiperspirant & it’s great – Smells fresh & literally goes on dry & clear! Dove deodorant is the only one I love and will use! Thanks! I love the dove deodorant!! My two year old has several allergies so we use the shampoo and body wash for my three youngest that bathe together so he doesn’t get irritated. Without it, he breaks out every time! I love their soap! But their lotion if pretty great too. My family uses Dove beauty white bar. We have been faithful users of this product for years. I would like to try their deodorant as well. I Love Dove’s Body Washes! They are so Perfect!!! When I use them I feel clean and get softer skin. We love the shampoo and conditioner. My daughters also use their deodorant. This would be a great giveaway for our family to win!! Dove deodorant is the best. I love their deodorant and body wash. Very gentle on my skin. Dove has a great smell and I enjoy many of the lotions. I loved using the body wash with defoliant or beads or something like that. My favorite is the cucumber melon. I love Dove body wash. It smells and feels amazing. I’d like to try their body shampoo 🙂 They have many different scents! Dove’s white beauty bar soap is the best, especially for sensitive skin! Dove bar soap is amazing! Love their products! We use Dove body wash, soap and lotion in our house. Still haven’t tried Dove shampoo and conditioner, but would love to! I love the bar soap. Smells good! I use Dove shampoo and conditioner and Dove beauty bar as my regular shower routine! The bar leaves my skin smooth and clean, and the hair products give me great moisturized healthy feeling hair! We’re a loyal Dove soap family-as recommended by a dermatologist. We use Dove deodorant as well. Dove Body Wash with NutriumMoisture, for Sensitive Skin. I love, love, LOVE Dove dark chocolates! They are smooth and creamy, and they melt in your mouth. I absolutely love the body wash. I would like to sample the hair care products. I like Dove deodorant. Smells great and leaves your skin feeling nice and soft. I love the soap. It does wonders on my dry skin in winter. I’ve been seeing ads for their new products for curly hair and now that I’m natural I’d love to try them. That’s the first product line I would buy if I won the gift card. I had to try to new Dove dry spray deodorant/antiperspirant, and I love it!! Great smell and feel! I love their body wash…wonderful! I really like their body wash, very moisturizing! Recently started using their spray on dry deodorant and thought it was cool too! I love Dove soap and body wash!! I like good old-fashioned Dove moisturizing creme. Dove Advanced Care deodorant rocks. The Dove soap is great! I’d like to try their lotion. I love their soap and deodorant!! I love Dove Sensitive Body Wash because I can use it on my baby and it helps her not get excema! Dove soap has been my favorite for years. I love Dove clinical deodorant. The only body soap we use is Dove a Sensitive Skin body wash.
My face is always a disaster in winter. I’d like to try Dove lotion to see if I can improve the feel and texture of my skin. I absolutely love all Dove products but my family’s favorite has got to be Dove ‘s White Bars of soap and the Sensitive Bars of soap. Our family has sensitive skin and prone to acne even as adults..and Dove has never failed us ! These Dove products don’t irritate our skin like other products in the past have and Dove really does moisturize your skin. My acne gets bad at times as an adult and Dove’s Bar of soap is my go to secrete product. Yes that’s all I use, I use it daily on my face to fight acne and it works and keeps it smooth and moisturized,seriously. I’ve even had a woman ask me what I used when I was pregnant to have such clear skin and I said, just a regular bar of Dove’s white soap! She was amazed at my answer, as if I was supposed to tell her a long list of expensive products. If you want affordable, clear and moisturized body/skin; then I advise you try Dove’s Bar of soap lady’s and men too! Dove Sensitive Body Wash and the green capped deodorant (I think it green tea) only one I use. The only body soap we use is Dove Sensitive Skin body wash.
My favorite Dove product is their white beauty bar. It is the only “soap” that both my kids can use due to their skin sensitivities (as recommended by their allergist!). I am 57 yrs old, and can not remember a time in my life that we did not use Dove soap bars! mu Mother is 90 and still swears by them!! I love the smell and the cleanliness I feel! I would love to try the Oxygen Moisturizer! Love they have for sensitive skin also!! Great for babies too!! I absolutely love the body wash after the 1st time I used it … WOW!!! The Dove Body wash is my favorite product. I love the Dove Beauty Bar for Sensitive Skin! Many years ago, my husband had severe skin problems and his doctor told him to use Dove bar soap because it is gentle on skin. Ever since then we have been a Dove family. My husband uses Dove shampoo, conditioner and Dove Sensitive Skin Body Wash. I personally use Dove moisturizing lotion for my face, Dove Extra Hold Hairspray and Dry Shampoo. I also use Dove hair therapy conditioner and shampoo in the pomegranate and lemon verbena fragrance. I use Dove plum & sakura blossom scent antiperspirant deodorant. So you can see, we LOVE DOVE products; it’s so hard to choose just one product. I forgot to mention, we love Walgreens, and their employees are helpful and personable. I love to shop and save money At the Corner of Happy & Healthy! I can’t live without dove body soap. My skin itches like crazy with any other soap. Our family loves using Dove shampoo & conditioner! I love Dove conditioners and hair sprays! I would like to try their new spray on anti-perspirent/deodorant. I do love the little travel size soaps, I put them in a bowl for guests to use. I’d like to try Dove Deep Moisturizer because I get really dry patches on my feet and elbows. I LOVE dove’s daily moisture shampoo. I like it so much that I buy it in bulk at Costco. It’s the only shampoo I have used for the past 2 years! I love the Dove body wash for sensitive skin! I love their deodorant and bodywash! I love the Dove Deep Moisture body wash the best …a new favorite! Love their moisturizing bar- use it on my face daily! I recently received a sample of Dove “Dry Oil” for hair! LOVE, LOVE, LOVE it!!! Love the scent and my hair loves it! I love Dove body wash !!!! My husband always uses men+care shower wash, deodorant, and hair care, and he buys me Dove bar soap so I can have my own equivalent! I use Dove Sensitive body wash for my 2 kids who have severe excema. It’s the best soap for them, nothing else compares to it! I love Dove deep moisture body wash. And would love to try their lotion. I’ve used Dove soap for years, but just recently discovered their shampoo and really like it. I’ve used their moisturizing body wash! I would like to try the Dove Quench Absolute Crème Serum. It sounds like just what I need for my hair. I love the dove deep moisture shampoo, but would love to try any of the products. Dove always leaves my skin and hair feeling so soft. I would love to try the Quench Absolute Shampoo. It sounds so perfect for me! Thanks for the chance! Would love to try their advanced oxygen moisture shampoo and conditioner. I like Dove Body Wash because I feel like I am doing something positive for my skin’s condition – rather than just simply cleansing it. My favorite Dove product is the Dove Visible Care Body Wash. It is so gentle on my skin. i love the sensitive skin unscented beauty bar thanks!! Plain old Dove unscented bar soap is like magic for our family since my kids have sensitive skin. I love almost all the dove products I have ever tried. Dove is a name I can trust. Would love trying any of their new products! The Dove sensitive skin in the soap bar & body wash are both great products for people with sensitive skin. I would like to try the Dove Shampoo and Conditioner. I heard some good things about them. I love the shampoo made for color-treated hair! I like their new line of shampoo, it smells great and it makes my hair really silky. Dove soap bars. Its the only kind of soap I can use! I love the Dove Beauty bars! I have been using them for years! The sleek Dove Nutritive Solutions Shampoo & Conditioner bottles grace our shower! A must-have for soft, yummy-smelling hair (makes a great body wash, too)! I would love to try the Dove Deep Moisture body wash. My winter skin is always so dry! We always have the dove bar in the shower! I’ve tried their deodorant but I’d love to try the deep moisture hair care – it is so dry here right now! We use the Dove bar soap and it isn’t drying and is safe for my kids to use too. I love their shampoo also. It is one of my favorite brands. Gives my hair volume but makes it so soft, too. I’m always looking for a great body wash to leave me feeling moisturized without following up with lotion after every shower! My husband can’t live without Dove bar soap! I love dove body wash, it always leaves my skin feeling moisturized. I love Dove Body Wash as it leaves my skin so soft. My hair has been very dry this winter, I would love to try the shampoo & conditioner. I like the winter green dove that seems to only come out during the winter months. I would love to try the dove hairspray. I am always on the look out for new hairsprays and Dove is wonderful for other products, so I would love to try their hairspray. I love Dove body wash but would really like to try their hairspray. Thanks! the bar soap is nice. I love all the Dove Products but what I love most is their campaign that shows how beautiful all women are! What a wonderful message to spread to all of us especially the little beauties in our life! My favorite Dove product is the sensitive skin body wash. My daughter has terrible allergies and eczema and it is the only product I can use on her that doesn’t cause her to break out. We use the dove sensitive skin body wash ever since the dermatologist recommended it nearly 10 years ago and the allergist was glad to hear that at my husband’s appt last year too. I use the Dove deodorant and I’d like to try their shampoo. My son loves ear body wash and gathering deodorant. Wow for autocorrect…should say their body wash and deodorant. I love the Dove Dry Oil! It makes my hair so soft and shiny. I love Dove deodorant. It makes my underarm feel soft and smells fresh all day long. Anxious to try the instant-drying spray when I run. I use the body wash, my husband uses the bar soaps and we both love the lotion. We’re big Dove fans at our house! I love the shampoo & conditioner. It smells so fresh and makes my hair so soft! I love Dove body wash – the scents are amazing and it is moisturizing! the plain Dove bar soap is my favorite, and I use it since ever. The classic pink Dove soap bars – timeless and perfect ! I definitely need the Deep Moisture Body Wash for this dry Minnesota winter! I love the Dove hairspray and use it regularly. I love love love dove body wash!!!!! My mom taught me Dove soap was the key to beautiful skin. I’ve since added a few things, but I always have Dove beauty bars. My current favorite is the one with coconut milk. I also use Dove deodorant. MY favorite dove product is their beauty bar. I have been using it on my face for years. I use the shampoo and conditioner, it really helps make my hair shine and tames some of the static and frizz, especially during these cold winter months. I have also used the body wash, but typically prefer the good old bar soap for lathering. I haven’t tried the facial products yet, but would love to check it out! I’m looking forward to trying the new spray on dry deodorant! I would love to try Dove bar soap. I love dove’s dry shampoo. I would like to try the new spray on dry deodorant. Love Walgreens and Dove beauty care items!! I love the dove body wash. Very moisturizing. I am using the Dove Oxygen Shampoo now and like it. I love the traditional dove product of the curved bar soap, the wonderful scent takes me back to childhood days when my mother used it. I love this and other Dove products. It would have to be a toss up between Dove’s new Dry Spray Antiperspirant, Dove Cream Oil Intensive Body Lotion( Extra Dry Skin) and their Advanced Oxygen Moisture Shampoo…. With three teenage boys in the house, Dove Men Care body wash and shampoo are my go to products! I like the Dove Clinical deodorant because it works so well! Dove deodorant is one of the only ones that I can use because of my sensitive skin. I haven’t tried the Dove unscented soap mentioned above but would like too. Thanks for having these drawings! I’d like to try Dove’s body wash. Thanks!